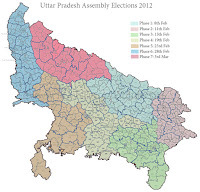 Around 57 per cent of the 1.75-strong electorate on Wednesday exercised its franchise for 56 seats in the third phase of the UP assembly polls in which Mayawati's ruling BSP is facing a strong challenge from Congress, SP and BJP. The incident-free third phase of the seven-part elections in the state will decide the fate of three cabinet ministers, a minister of state, 29 sitting MLAs and 14 former ministers. 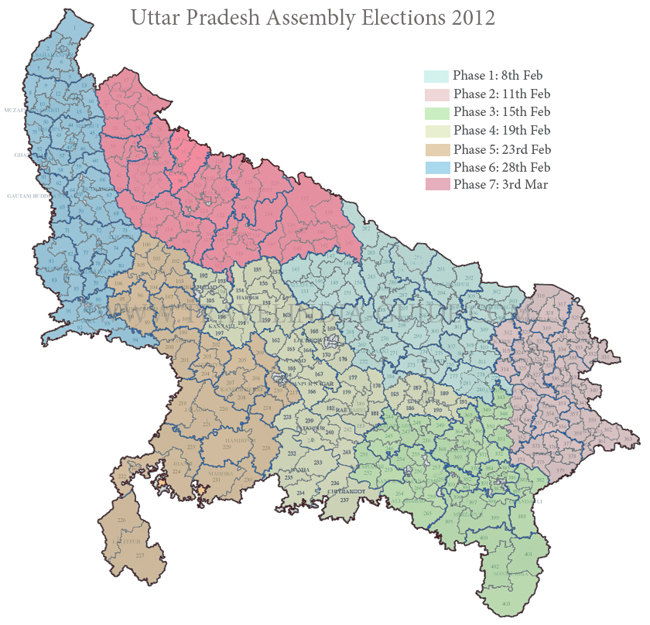 The remaining phases of polling for 403-strong Assembly will be held on February 19, 23, 28 and March 3. Counting of votes will take place on March 6. Till late afternoon, Sultanpur district had recorded a maximum of 50 per cent polling, whereas 44.88 per cent was registered in Jaunpur. "Voting began at 7 AM for the third phase of assembly elections and 47.05 per cent polling was recorded till 3 PM," Election Commission officials said. Among other districts, CSM Nagar recorded 47 per cent, Kaushambi 47 per cent, Varanasi 46.62 per cent, Bhadoi 47 per cent and Sonbhadra 46 per cent till about two hours before close of polling.